Geiranger fjord, Beautiful Nature Norway panorama. It is a 15-kilometre (9.3 mi) long branch off of the Sunnylvsfjorden, which is a branch off of the Storfjorden (Great Fjord). 4k00:11Geiranger fjord, Beautiful Nature Norway panorama. It is a 15-kilometre (9.3 mi) long branch off of the Sunnylvsfjorden, which is a branch off of the Storfjorden (Great Fjord). 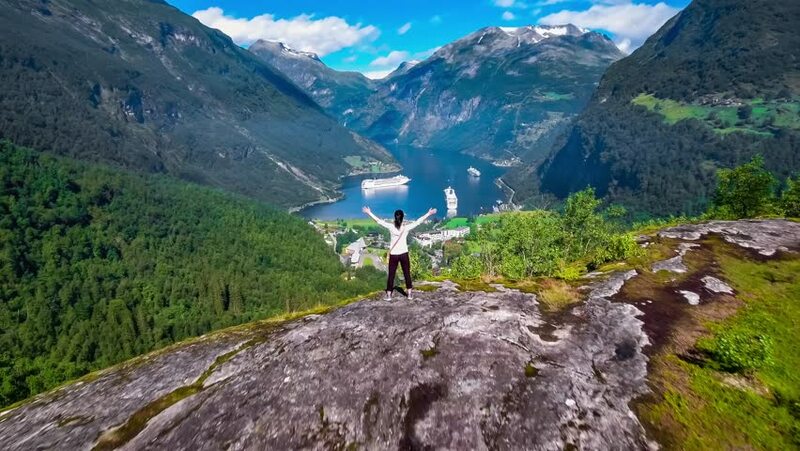 4k00:18Geiranger fjord, Beautiful Nature Norway panorama. It is a 15-kilometre (9.3 mi) long branch off of the Sunnylvsfjorden, which is a branch off of the Storfjorden (Great Fjord). 4k00:10Following Footage of the Beautiful Fit Woman Runner in Sportswear Jogging on the Trail With Breathtaking Mountain View. Long Shot in Slow Motion. Shot on RED Epic 4K UHD Camera. 4k00:11Woman looking at the laptop near the camping . Caravan car Vacation. Family vacation travel, holiday trip in motorhome RV. Wi-fi connection information communication technology. 4k00:11Nature photographer tourist with camera shoots while standing on top of the mountain. Beautiful Nature Norway Lofoten archipelago.